Diosmin – aids in hemorrhoid treatment, particularly as a vascular protector. There is no indication of how much of some of these ingredients is in each HemTab hemorrhoid pill. The recommended dosage is not to be found anywhere on the internet. It seems this is privileged information only to paying customers who have access to the bottle. As far as side effects, witch hazel and horse chestnut leaf, two of the main ingredients, each come with a risk of vomiting and upset stomach, while hesperidin may trigger a number of side effects that include abdominal pain, diarrhea, and nausea.Some consumers of blond psyllium have experience severe hypersensitivity reactions.Anyone with allergies to latex must not take supplements containing horse chestnut without consulting a physician. If you have diabetes, then you must check your blood sugar level regularly when taking this medication. Horse chestnut is known to lower blood sugar levels, and so it must not be taken with certain diabetic medications. 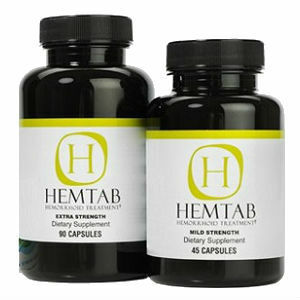 There are different supplies of HemTab depending on your severity, however the most popular seems to be the rapid healing package, which istwo cycle treatments, available at$89.50. There is no indication on how many pills you receive with each bottle. If the pictured bottle was legible, you might be able to perceive a number, however we were unable to glean a definitive number from squinting at the picture. A 120 day money-back guarantee is offered for this product. While outwardly this seems like a great policy, the claim is that the product cures the issue within five days. Given this small time frame for relief, why the large return time? Is the company just patting its own back or is there an underlying reason why the window is so large? It is tough to say if this product does all it claims given that the product seems exclusively available through their website. This limited purchase option means there isn’t anywhere for actual customers to post actual, real-life results. If you try and search customer reviews of this product, you will be cycled back to their testimonials page. John Parker	reviewed HemTab	on September 3rd	 and gave it a rating of 2.